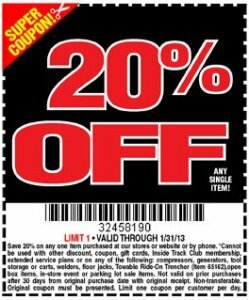 20% off Harbor Freight Coupons can not only get you some pretty good deals on some decent tools at Harbor Freight, but did you know you can use these same coupons at other stores to save you big money on real tools? There have been a number of reports of people successfully taking 20% off Harbor Freight coupons to the likes of Home Depot or Lowes and saving upwards of $100 off of $500 table saws. If you don't mind a little work, here is how you can save some cash. Many stores have a policy where they will accept competitor coupons. Now, be warned that your results may vary depending on the store you visit, as well as the manager you talk too. In the case of Home Depot, there is a little bit of a grey area as to whether Harbor Freight is truly a competitor. They do sell tools, but not really the same tools. Of the reports I have seen where this has been successful, many of them have taken place at the Home Depot and they were all used on the higher end Ridgid table saws. Ridgid is a Home Depot exclusive for many tools and Home Depot might be more willing to accept the offer on Ridgid products. There are also successful reports that Lowes will accept Harbor Freight coupons as a competitor . I always say that time is money, and it might take you some time to call around or visit a number of Lowes or Home Depot stores to see if they will accept the Harbor Freight coupon. But if they do, your time might be worth the money you save. One man's trick was to try to use the coupon right before the store closed, and play hardball when the manager tried to offer him only 10% off. Hey, 10% is better than nothing, but 20% is better. Remember Harbor Freight sometimes even offer 25% off coupons. My plan would be to call ahead and ask the store if they accept competitors coupons - but do not mention the competitor or the coupons savings. When you hear that "yes", you can then go to the store and argue your case. Be sure to save those Harbor Freight coupons when they come in the mail, but if you can't, Harbor Freight always seems to have one on their website. Does Home Depot Accept Harbor Freight coupons? Just to recap, Home Depot does honor competitor's coupons, but YMMV as to whether or not your Home Depot manager will consider Harbor Freight a competitor. It is best to ask the manager but not let him know who the competitor is until you are ready to check out. Does Lowe's Accept Harbor Freight coupons? Users have reported in success that Lowe's will also honor Harbor Freight coupons, but again YMMV as to how successful you will be. Just because someone got a deal, it doesn't mean everyone will. Try and use the tricks mentioned above to have a better chance, and be sure to repot back here when you are done.